It’s evening and you’re waiting for your ride outside your building’s entrance, when rain begins to fall. Luckily, your clothes and hair are safe under the cover of the building’s landing canopy. You glance up and notice that a state-of-the-art, beautifully designed glass canopy is shielding you from the elements. Your ride finally arrives, and you can start the night off in style without missing a step. 5333 Connecticut’s glass canopy is a huge standout of the building’s design and construction. It’s meant to provide residents and guests with a grand, dignified entrance, and is a symbol of our commitment to providing comfortable, modern living. It blends in seamlessly with the overall theme of transparency, spaciousness, and airiness that makes the building stand out. The canopy was designed and engineered by the late Rod Garrett of Skidmore, Owings, and Merrill LLP (SOM). SOM is one of the world’s largest architecture and urban planning firms. They have an impressive list of domestic and international projects, including the Poly International Plaza in Beijing, China, and the Denver Union Station in Colorado. They’ve won more awards than any other firm, and we are proud to work with such a distinguished organization. Garrett’s approach to design combines aesthetic creativity with practical function. Mark Regulinski, also of SOM, describes Garrett’s design perfectly, stating, “Nothing makes an arrival more dignified than a well-lit entrance under a great and elegant canopy”. 5333’s landing canopy is constructed of two seamless stainless steel segments. The segments are roughly 58’ x 13’, and were imported directly from Ontario, Canada (around a 500 mile drive!). These provide the structural support and strength for the glass canopy. They also create a feeling of streamlined elegance when compared to more traditional columns, which can look bulky. The canopy’s glass segments consist of 15 separate panels. These were chosen to accentuate and compliment the building’s use of floor-to-ceiling windows. The idea of light and clarity is a theme that runs throughout 5333’s design, and this is captured perfectly with the glass canopy. The steel structures and glass panels took an entire day to install. Digging & Rigging Inc. supplied a 200-ton crane for the process, while Metropolitan Walters conducted the actual canopy construction (special thanks to these companies for their highly professional work!). Make your entrance today in one of DC’s finest luxury living spaces. We’re located in the heart of Chevy Chase, near all the best dining and entertainment in DC. 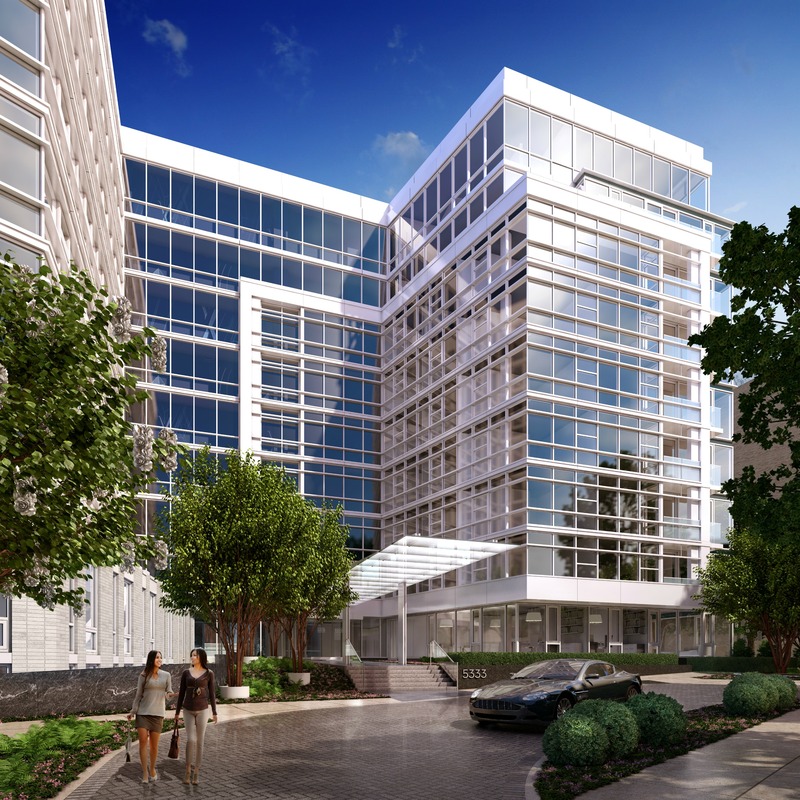 Contact us today to reserve your space at 5333 Connecticut Ave., where design meets function in the most spectacular way.